The dual goals of the School Counseling & Assessment Department are to provide student assessment data to schools, parents, and students, and to provide leadership and support for school counselors and counseling programs. Student assessment data drives decision making at every level of educational programming. The School Counseling & Assessment Department provides quality student assessment services to schools, including the administration of standardized tests and scoring and reporting of achievement data. Other services include consultation and training in school accountability data, program evaluation, research, and use of assessment data. The Marion County Comprehensive School Counseling Plan is designed to build student success in the program’s three content areas of Academic Achievement, Career Development, and Social/Personal Development. This data driven program meets the needs of all students by helping them acquire competencies and knowledge of self and others. The School Counseling & Assessment Department provides leadership and program support for school counselors as they implement the program, with the assistance of the School Counseling Leadership Team. 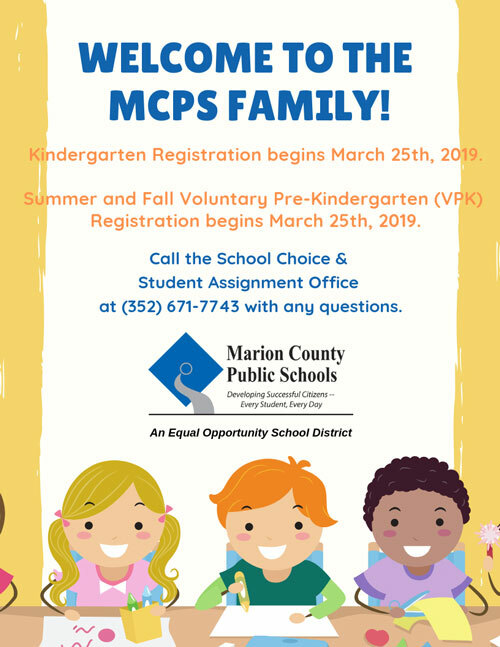 Through the provision of student performance data and the facilitation of school counseling programs, the School Counseling & Assessment Department plays a central role in assisting Marion County Public Schools in developing successful citizens--every student, every day. On February 18, 2014, Florida adopted new educational standards for students in grades K-12. The Florida Standards detail expectations of what every child should be able to do at each grade level. Developed with unprecedented input from Florida teachers, educators, and the public, these standards emphasize critical and analytical thinking that goes beyond memorization. Starting in the 2014-15 school year, Florida began administering the Florida Standards Assessment (FSA) to determine how well students are meeting the Florida Standards. The FSA includes more than just multiple choice or simple fill-in-the-blank questions. Students are asked to create graphs, interact with test content, and write and respond in different ways than on traditional tests. Question types assess students’ higher order thinking skills in keeping with the higher expectations of the Florida Standards. Parents, students, and educators can preview samples of question types by taking practice tests that are available for anyone interested in reviewing them. In 2018-19, the FSA subject area tests will be English Language Arts (grades 3-10), Mathematics (grades 3-8), Algebra 1, and Geometry. Reading and Writing are both components of the English Language Arts (ELA) subject area test, with the exception of the grade 3 ELA which has no writing component. The FSA ELA Reading and FSA Mathematics for grades 3-6 and FSA ELA Writing for grades 4-6 will be paper-based assessments. Grades 7 and up FSA ELA Reading, FSA ELA Writing, and FSA Mathematics will be computer-based assessments. FCAT Reading, Math, and Writing which assessed how well students were meeting the Next Generation Sunshine State Standards are no longer being administered. Statewide Science in grades 5 and 8 is still administered and is a paper-based assessment. Other Next Generation Sunshine State Standards tests that are still administered are Biology 1 EOC, Civics EOC, and U.S. History EOC. All of these tests are computer-based assessments. Florida’s law for promotion and graduation requirements remains the same. Students entering 3rd grade in 2018-19 will be required to achieve a certain score on the 3rd grade assessment in order to meet promotion requirements. Students not meeting these criteria may still meet promotion requirements through the exemptions that are currently available in statute. Students entering 10th grade and/or taking Algebra 1 are required to achieve a certain score on the respective assessment in order to meet state graduation requirements. These students have the opportunity for retakes. To access 2018-2019 Florida Standards Assessment (FSA) dates and other test dates, please see the 2018-2019 District Assessment Calendar. During the 2010-2011 school year, the computer-based FCAT assessment was implemented in Florida public schools for the first time. In spring 2019 FSA will be administered via computer to students in grades 7-10. All state End of Course assessments are also computer-based.